Sherman Peabody of Sherbrooke was on the Bishop’s golf and hockey teams and a popular man on campus when World War II broke out. Leaving the school without finishing his degree, he became a RCAF Flying Officer and the pilot of a Lancaster heavy bomber. In 2016 the family of Sherman Peabody commissioned the History Department to find out the truth about his fate and that of his fellow crew member Flying Officer Doe. Over the past academic year, three of our intrepid students have followed the trail of Sherman Peabody from the Old Library in McGreer, to National Archives in Ottawa, to the Public Record Office in London, to Cirey (pop. 48) in the Vosges Mountains of France. 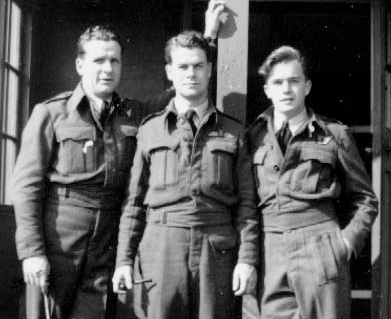 Their story connects a Bishop’s University student to Bomber Command, the French Resistance, SAS, the Gestapo’s war crimes… and to a small French village where the wartime crash of a RCAF plane still reverberates today. On Tuesday, April 11 at 2.15 in Cleghorn Room Megan Whitworth and Sean Summerfield, two graduating History students, will be presenting their findings on the mystery of Sherman Peabody’s disappearance through a slide show and talk. ALL are welcome to attend. Over 100 attended including Dr. Michael Childs and Principal Michael Goldbloom. Harold Sherman Peabody, a pilot during WW II, left Eastern Townships in 1941 and never returned home. After 76 years since Harold Sherman Peabody left the Eastern Townships to join the military, his family members are starting to get some answers as to what may have happened to him. Peabody, a science student at Bishop’s University in the late 1930s, joined the ranks of the Royal Canadian Air Force in 1941. The pilot never returned home to Sherbrooke, Que., and until recently, his family never knew what happened to him as they to all went to their graves. “This was one of those mysteries in our family that we never really pursued,” said Robert Peck, whose mother was Peabody’s second cousin. Robert Peck and his brother, Jonathan Peck, enlisted the help of a group of students at Bishop’s University and funded the research to find out what actually happened to their late family member.